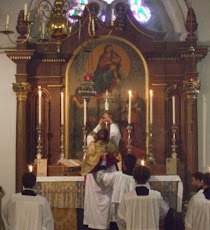 Fr Hunwicke's Mutual Enrichment: Ordinariate Use: can any priest say it? "In cases of pastoral necessity or in the absence of a priest incardinated in an Ordinariate, any priest incardinated in a Diocese or in an Institute of Consecrated Life or Society of Apostolic Life may celebrate the Holy Eucharist according to Divine Worship for members of the Ordinariate who request it." Non sequitur alert, Father. My wife, who characterizes herself as an 'Anglo-Catholic' (no ordinate near Bantry, County Cork,I'm afraid) wonders if the NO priests of our parish have put the 'Stir-up our hearts, O Lord' Collect in their back pocket today. Can you tell me if that particular Collect is yet read on the last Sunday before Advent commences? Hello, Liam! Good to hear from you again: I hope that West Cork is as gorgeous as ever. Stir Up only gets a look-in on weekdays this week, because today, Sunday, lamentably, is occupied by Christ the King. Looking up at my splendid Papa Stronsay Calendar, I see that Friday will be the only opportunity for this Mass this year. But this need not stop your wife from flexing her biceps as she Stirs cakes and puddings. My wife has been mysteriously active in the kitchen this afternoon. BUT the Extraordinary Form, of course, still does Christ the KIng in October and so they ... er ... I mean we ... have been Stirring today with the best of them. Surely West Cork must have zillions of keen young 27-year-old priests celebrating the Old Latin Mass more or less non-stop? You have put me in a delicate situation. I dare not approach she who must be obeyed in a manner that suggests a domestic stirrup lest I really want to stir things up. We usually compromise in any event. She prints out a recipe for me, I concoct the cake, she critiques it, and I wash up. It works out well. Wets Cork is teaming with many things but 27-year olds of any stripe in Bantry Town have long past fluttered off to the big smoke and wi-fi oases of Cork or Dublin. We do have the EF (praise God) once a year in Bantry otherwise ye git on yer bike an pedal yerself off to Cork if ye want the EF regular-like. I'm off now to make apple-sauce, raisin, and walnut bread.